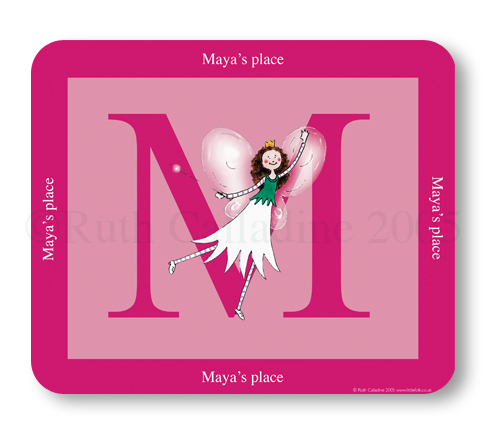 A personalised fairy placemat. This wipe clean personalised Fairy Alphabet placemat from Little Folk features Fizzy the Little Fairy. You can personalise the placemat with your child's name, eg Annabel's place, and choose from four background colours: pink, lilac, green or blue. The placemats are available in two sizes, standard and large. Each of the Little Folk personalised placemats and coasters are individually made to order. We design and then print each mat by hand. The Little Folk placemats and coasters make great birthday gifts for boys and girls, Christmas gifts, Christening gifts and are perfect for everyday use. Please note that names ending in 's' eg James will require an apostrophe on some of the gifts. For example, placemats will be printed as 'James's place'. If you would prefer an alternative punctuation please indicate this when typing in the 'Child's first name' panel. Hardboard with melamine coated top surface. Care instructions: Store flat. Wipe clean only. Size: standard 19 x 23cm, large 23 x 32cm. Matching coaster also available. Size 9 x 9cm. See the full range of personalised placemats and coaster here.